Burning through more surplus egg yolks today! I reached for one of my favorite chocolate theme cookbooks Pure Chocolate: Divine Desserts and Sweets from the Creator of Fran's Chocolates(written by local Seattle chocolate maker Fran Bigelow). This book will be my key to removing the tubs of egg yolks sitting in my refrigerator... it will of course decimate my chocolate supply too, but Fran's recipes are always worth it. In a heat safe bowl, beat the eggs and sugar together until the mixture is uniform and light in color. Place over a double boiler and whisk until slightly thickened. A ribbon of the egg sugar mixture should flow back into the bowl when the whisk is lifted and the sugar should just be beginning to dissolve. Add the Frangelico (or water) and then continue to whisk over the simmering water until the mixture hits roughly 160°F and coats the back of a spoon. Remove from heat and add the finely chopped chocolate. Stir until your arm cramps or the mixture becomes cool to the touch, whichever comes first (roughly 10 minutes). Serve in demitasse cups with espresso spoons and a dollop of lightly sweetened whip cream, sprinkled with a little grated dark chocolate. That looks so wonderful!Just thought I would let you know. Ha ha, love that last pic! Only...you left some whipped cream there. How could you??? Nothing in that photo was wasted. Yummy! That's something me and my kids will fight about. Love it to the last drop? Dark chocolates are the healthiest dessert there is. Thanks for sharing. God, I could make love to that mousse. Right now is when I fall in love with mousse. That looks SO good! I'll definitely have to bookmark this recipe for the next time I have so many egg yolks left over! It must be the thing to cook, my chocolate deprived daughter has just made her first lot of chocolate mousse, the recipe is a little different but in the end its a delicious chocoately treat, oh yummm. Something I think you'd enjoy doing with egg yolk is piping them into a simmering simple syrup, into nest shapes, then filling the nests with berries, and drizzling a little more of the simple syrup over them. Tastes divine if you flavor the simple syrup before piping, with mint, or lavender. 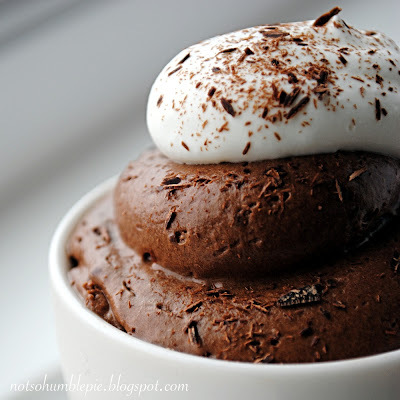 This mousse looks so rich and decadent! My goodness!! I love the last photo. Question: Could you sub the liqueur with espresso immersed in hot water? Thank you for thinking of the non-drinkers out there. Mmmm, you can almost taste how rich it is!! Your posts always make me so hungry! Oh my gosh, that looks so yummy, and doesn't sound too hard to make either! I think the second picture looks like a poop. Is that weird that I think that??? I would still eat it though, no matter what it looked like. YUM! I LOVE Fran's cookbook (and Fran, of course). The bars with the chocolate shortbread crust, coconut cream filling and chocolate topping are to die for. Of course, her coconut gold bar is my favorite treat of hers. How have I not seen your site before! These look divine...can't wait to try some of your recipes. I WANT THIS...NOW!!! Your pictures are gorgeous! Absolutely! You can substitute equal amounts of coffee or espresso for the water/booze in the recipe. Mocha mousse... mmmmm. Oh. My. God. I think I know what I'm making for a dinner party this weekend. I have to know how you got that mousse into the cups so neatly. 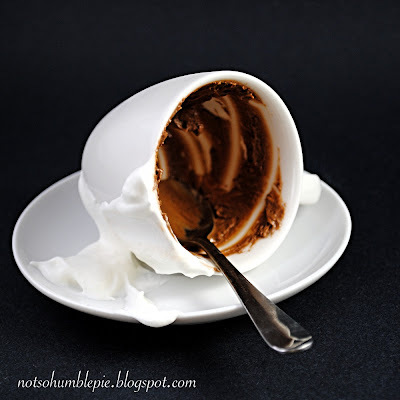 Whenever I try serving anything attractively, it ends up looking terrible and I can't imagine how to get mousse into tiny demitasse cups without getting mousse everywhere. ...Mousse is too close to mouse. I used a parchment cone to pipe the mousse into the cups. Yes, mousse is too close to mouse. Sometimes I don't catch myself and I am very happy I can edit these after I post them. I tried to use a parchment cone to pipe the mousse, but all I achieved was wasting mousse. Alas. NO waste. Just unroll it and lick it clean. There, see? I was looking for a very old (circa 1980) James Beard chocolate mousse recipe from Gourmet magazine. This one is very much like it - with one exception. I used your recipe, but folded in the five egg whites, beaten with about 1T of confectioner's (powdered) sugar, before folding in the whipped cream. Instead of Frangelico I used Framboise. The other choice of what was on hand was Cointreau - which would have been excellent as well. So, how do I keep the teenagers out of it? I labeled it "Chopped Liver for Oneg Shabbat"
I've spiked my white chocolate desserts with Frangelico, but never dark chocolate...mmmmmmmm. Great idea! Do you portion this into cups directly after folding in cream, or do you wait until after the 4-hour chill? Also, am using this for a party in two days -- how will it stand up portioned out over the course of two nights? Will it be weird? It can be done either way. The mousse won't sacrifice much in texture or volume if you wait the 4 hours and then portion it to serve. It is a bit easier to pipe into dishes after it has set-up, however. It will also hold quite well for two days in the refrigerator. I would mind that it is well covered to prevent it from absorbing any odors durring that period. Would this be good as a cake filling? Or would it be too soft and squish out when I put the second cake layer on top? Oh yes, It makes a great cake filling and doesn't squish when allowed to filly chill and set before using (unless of course you press down on it). 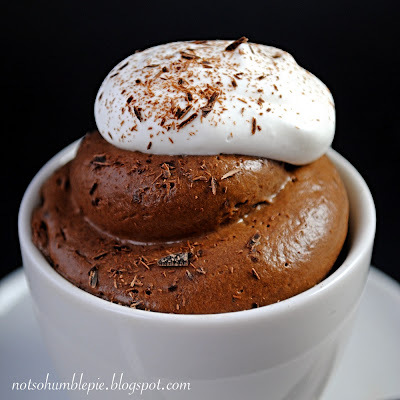 The Midnight Sin Chocolate cake on the blog is filled with this mousse.